The date sheet 2019 of various certificate, diploma and vocational training program will be issued by the Khyber Pakhtunkhwa Board of Technical Education (KPBTE) according to prescribed schedules and after the duration of one month the board organizes final exams of these courses. KPBTE offers Diploma Courses, Certificate Courses and Vocational Programs in various branch of learning. KPBTE announces its date sheets off and on in different timings. As soon as the date sheet of these programs will be issued it will be uploaded right here. Stay with us for further updates. The Khyber Pakhtunkhwa Board of Technical Education (KPBTE) was established in March 1973 and its major duties are to organize, regulate and supervise Technical, Commercial and Vocational Education and other degree programs Khyber Pakhtunkhwa province and its linked tribal areas. It is an academic and examining body for the short courses of commercial, vocational. Many private technical institutions with computer training institutes are affiliated with KPBTE. KPBTE conducts exams and announces date sheets off and on in set schedules and normally announces date sheet one month earlier. The board also offers scholarships to brilliant and needy students. After successfully completion of exam the board awards certificates, diplomas, medals, prizes and scholarships to talented students on the basis of obtained marks. ilmkidunya will upload all the details of final exams and date sheets of short courses and could be seen right here on this page soon after official announcement. To get more details stay in touch with us. Here you can check all the information of previous and upcoming examination's date sheets of Khyber Pakhtunkhwa Board of Technical Education at below links. 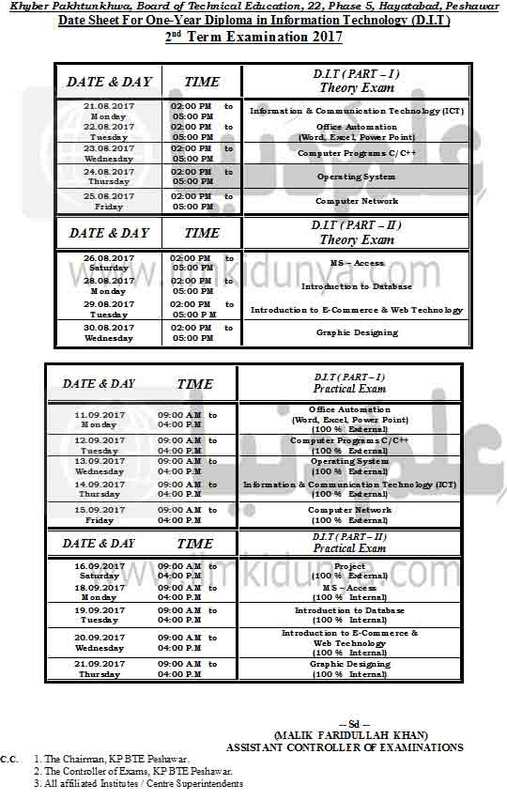 ilmkidunya has given details of previous and upcoming examination's date sheets of Khyber Pakhtunkhwa Board of Technical Education on this page. You can check date sheets of previous exams by clicking on the link. Sir DAE ke admission ke last date kb ha! ! ! ! Sir DAE result kab hain.